Chaats are having the power to work miracles!an inevitable mesmerizing snack!a real kind of fast food I must say involving fresh ingredients made in a jiffy.Nowadays chaats have gained popularity all over the world with all its spiciness,tangyness,sourness and sweetness in it.Aloo/potato is the most significant ingredient in almost all the chat varieties!these potatoes pairs up with most of the vegetables and fruits. Chaats become worthless and meaningless without Chat masala the primary ingredient that makes the chaats to taste divine.Drooling sweetness and splashy crunch are from ever gorgeous fruit the pomegranate!the real crispy crunch are from the roasted peanuts.Green chutney is one which gives the sharpness and spiciness to this salad/chat that coats the bland potatoes,onions are yet another ingredients that are most evident in most of the chaats prepared.This particular chat am doing is very healthy and tasty that you will not ignore just like that. Grind everything given for green chutney by adding little water and make a paste. 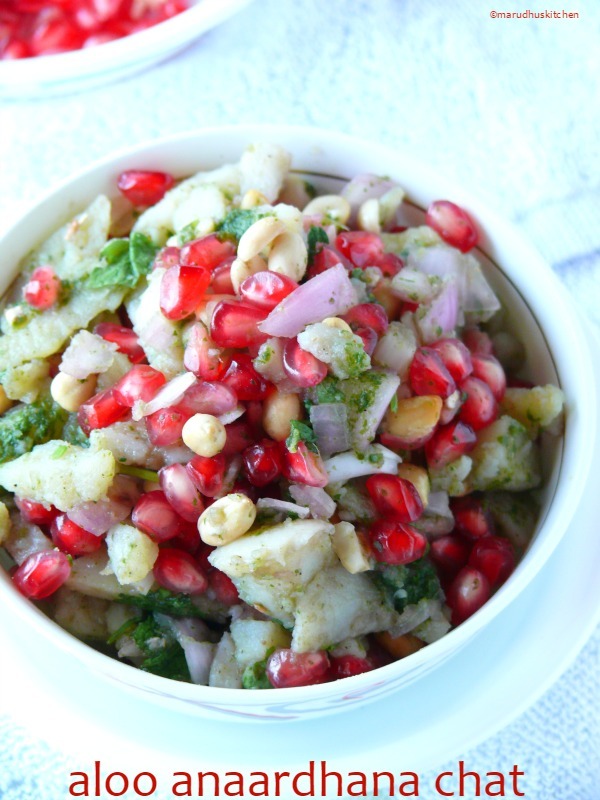 1.In a big bowl combine potatoes,pomegranate,onion,green-chillies,peanuts,mint-coriander leaves,chat masala,salt and toss it well. 2.Now squeeze lemon juice and mix. 3.Then add 3-4 tsp of chutney and combine well. In a big bowl combine potatoes,pomegranate,onion,greenchillies,peanuts,mint-coriander leaves,chat masala,salt and toss it well. Now squeeze lemon juice and mix. Then add 3-4 tsp of chutney and combine well. Aloo anardhana chaat should be made and served immediately. It will become soggy if kept for longer time. You can increase the spiciness according to your taste. What a fresh burst of flavours in this mouthwatering chaat dear. The tangy green Chutney with a hint of lemon and the slow popping up of the anardana to let out a juicy sweetness. A perfect snack for the summers. Yummmm. Delicious and mouth-watering chaat! Looks YUM! Wow it looks so beautiful and tempting. 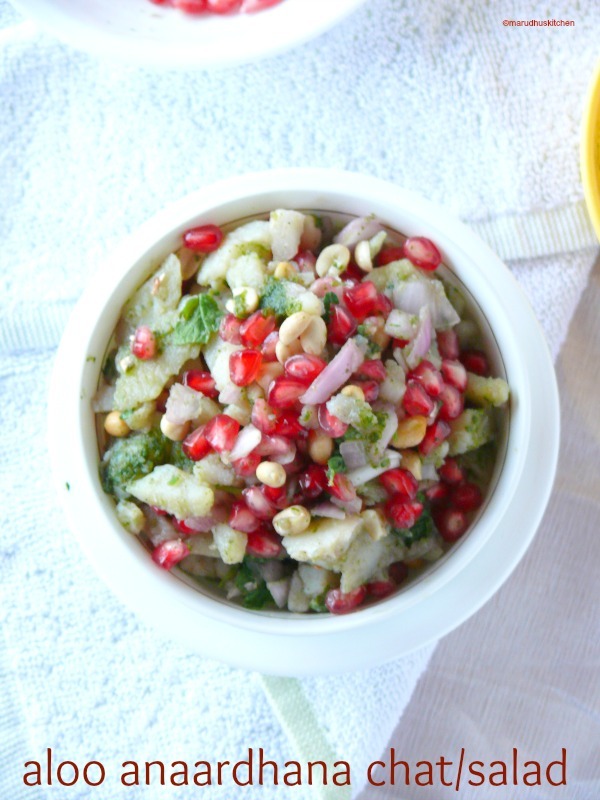 Love this chaat recipe !! so delicious and filling too! yum! I love potato salads and I am always looking for new variations on it. Your recipe sounds delicious, I might try it. Thanks for sharing.